Just a heads up on a new seasonal release from Snoqualmie Falls Brewing. I saw this in the cooler at Bottleworks over the weekend, so it is already available. The Snoqualmie Falls Brewing Company is pleased to announce the next beer in our annual series of new beers that honor items of significant local historical interest. Last year’s release, Plant 1 Powerhouse IPA, was a tremendous success. 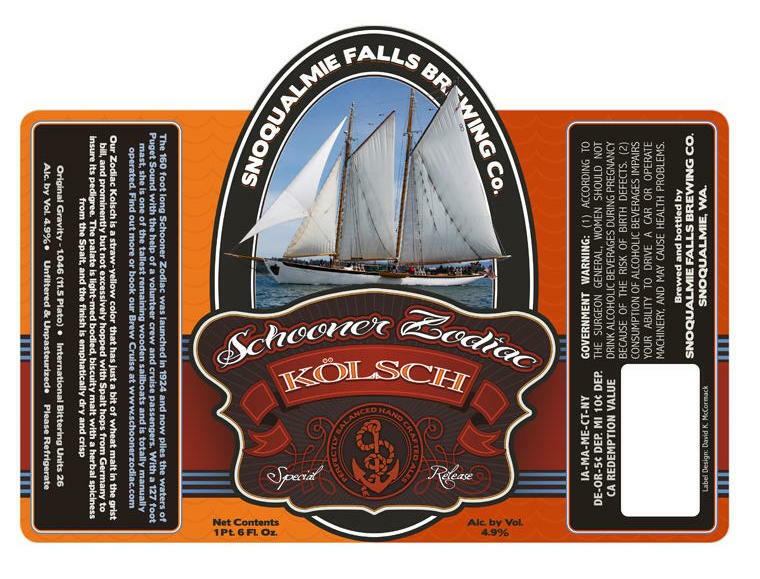 This year we are very excited about our new project, Schooner Zodiac Kolsch, named in honor of the sailing vessel, The Schooner Zodiac. Built for the heirs to the Johnson & Johnson family; the Zodiac was designed by William H. Hand, Jr., to epitomize the best features of the American fishing schooner. In 1928, she competed in the Transatlantic Race for the Kings Cup where she finished in fourth place. During the Depression, the Zodiac was sold to the San Francisco Bar Pilots, and renamed California. She worked the rugged waters outside the Golden Gate for forty years, retiring in 1972, as the last working pilot schooner in the United States. In late August 1946 Willard Carroll was returning from Pearl Harbor aboard the troopship USS Hermitage. The California (Zodiac) came out and put the pilot aboard. In the mid 70s, the Vessel Zodiac Corporation was formed to operate and maintain the schooner, whose maiden name was promptly restored to Zodiac. Drawing on an experienced crew of sailors and shipwrights, the ship was restored to her former beauty and sailing strength. In 1982 she earned a spot on the National Register of Historic Places. She continues to work the waters of Puget Sound, San Juan and Gulf Islands to this day. Every year, the Zodiac hosts their Northwest Brewery Cruise. Join fellow micro-brewery lovers and home-brew fans from around the world on the Schooner Zodiac as she sets sail for famous San Juan Island brew-pubs! Northwest ales are world renown and the San Juan Islands are home to several spectacular breweries. Enjoy four days of sailing onboard the Zodiac in the beautiful Puget Sound waters while celebrating the Pacific Northwest’s array of fine ales. Your onboard hosts for this trip will be brewer Dave Eiffert from Snoqualmie Brewery, food pairing expert AnnaLou Vincen and guest chef Travis Surmi for the Brewmasters Dinner. This Friday night, at 7pm, our Taproom is hosting one of the crew members of the Zodiac for a release party starting at 7pm. Gunnar will be hosting a short DVD viewing party of some aerial flyby’s of the ship and answering questions about the ship. Attached is a copy of the label of this new beer, designed by local graphic artist David McCormack, that shows this majestic vessel.